Prof Greg Walter (left) and the rest of the study tour group outside the Colosseum, Rome. 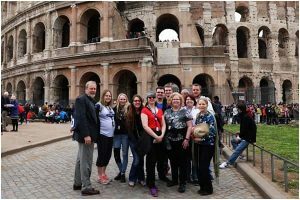 From March 7-18, I had the privilege and pleasure to lead 10 DSU students on a study tour of Italy. I teach art and art history, so this trip was particularly special for me, with Italy being the epicenter of so much art, architecture, literature, theater and music from ancient times until the modern era. Those 11 days exposed our students to more art, history, and culture than they could get in an entire semester in the classroom. We visited 10 cities, over 20 museums and galleries, walking approximately 80 miles. We ate pounds of pasta and pizza, cups of gelato, and the more adventurous even sampled squid, octopus, and cuttlefish. We immersed ourselves into the birthplace of the Renaissance in Florence, the birthplace of banking in Siena, and the birthplace of the Roman Empire in Rome. We were there on the Ides of March, the anniversary of the assassination of Julius Caesar. We visited working ateliers of leather, sculpture, and glass, along with one of the finest vineyards and olive orchards in Tuscany. We experienced the stunning mosaics of Ravenna, the Gothic Byzantine capitol of the West, the unique beauty of Venice, the floating island-city, ancient (pre-Roman) Etruscan caves in Orvieto, and the amazing time capsule of Pompeii. We spent most of a day in Vatican City, which, although it is the smallest country, it boasts the largest church (St Peter’s Basilica) and art collection in the world. Then, to cap it all off, we ran into Governor Burgum at the Minneapolis airport; he was on the same flight back to Bismarck, and we shared our story with him. Our DSU students did a wonderful job of representing our state, city, and University, with pleasant, respectful, and open attitudes throughout our journey. I have led several groups on different types of trips in the past, and this group is one of the best I have had the pleasure of leading. I hope to make this study tour a regular event. Visit our Wakelet page for a full album of photos and a travel blog courtesy of students Austin Stockert and Hailey Entze.